Initiated in the 1950's as a visual art workshop related to a psychiatric institution, the Art/Brut Center Gugging near Vienna in Austria currently is an independent cultural organization that unites a museum/gallery, a conference unit, a restaurant, a shop and a residential home where artists with psychic problems can live and work, the Artists House (Haus der Künstler). This Artists House is registered as an institution for social care. One of the well known Gugging artists is August Walla (1934-2001). Born in the small community of Klosterneuberg, near Gugging, August Walla soon lost his father. As a young boy with a weak condition he was teased by other children. He was diagnosed schizophrenic at age sixteen after he had tried to set the house afire. For some years he would stay in psychiatric custody. Already as a youngster he expressed his creative talent by abundantly decorating found objects with insignia and making paintings on objects in public space. In 1983, when almost 50, Walla was admitted to the Haus der Künstler where he stayed until his death. During his stay Walla would demonstrate a high productivity in many areas of art. 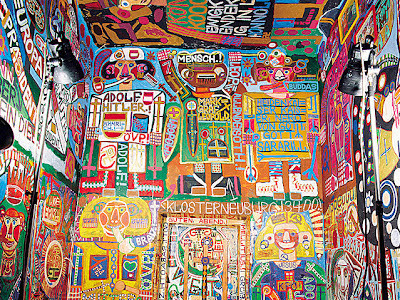 One of Walla's creative activities was decorating walls with paintings, such as the house's exterior front wall, but also the walls of his room in the Artists House. A characteristic of his work is fear of emptiness, so the paintings on the walls and the ceiling of his room fit seamlessly together. The room can be visited during special occasions, like expositions. 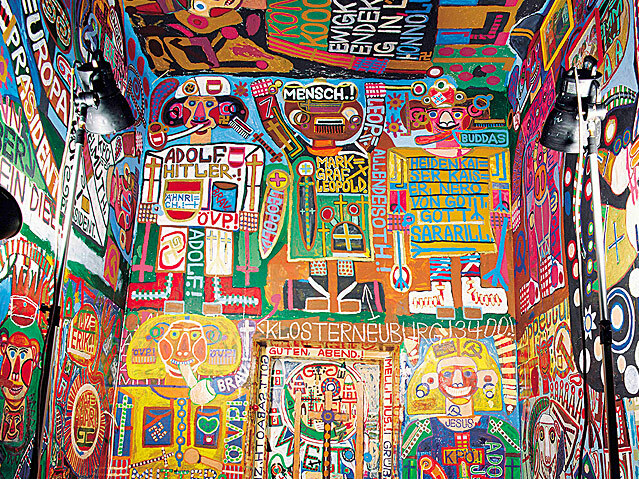 In 2012, from march 29 till October 28, the Gugging Museum had a major exhibition of August Walla's artistic work, with a life-size replica of Walla's decorated room. j'aime les peintures de walla..et les dessins de fischer, un autre autrichien.. et naturellement ce blog!